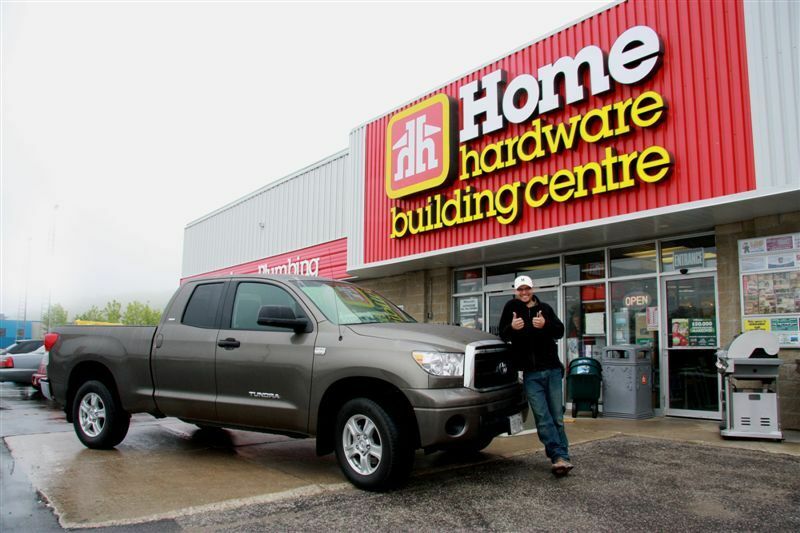 St. Jacobs, ON, May 27, 2009 –Local Owen Sound resident Chris Taylor, was surprised to learn he was the grand prize winner of a 2009 Toyota Tundra while making a routine visit to his local Home Hardware Building Centre. Chris entered a ballot for the contest in January while in attendance at Home Hardware’s Tough as Nails Contractor Show in Orangeville with local business Steve Doherty Construction of Owen Sound. While visiting Smith & Hladil Home Hardware Building Centre to pick up some supplies, Chris Taylor was greeted by Dealer-Owner Ken Smith, Joe Jacklin, Contractor Communications Manager of Home Hardware Stores Limited and Sam Tantsis of Toyota Canada who were there to announce the good news and award Chris with the prize. “It’s rewarding to be able to say thank you to our customers in such a big way and we’re thrilled to have the grand prize winner at our store,” said Ken Smith, Dealer-Owner of Smith & Hladil Home Hardware Building Centre. Toyota Canada Inc. and Home Hardware recently announced a multi-year business relationship, with Toyota as the official vehicle of Home Hardware and Home Hardware as the official home improvement retailer of Toyota. The companies are both known for their quality, value and customer service levels, which makes it a natural partnership. Through this partnership, Toyota Canada and Home Hardware work together on marketing promotions - such as the Win the Truck that’s Tough as Nails contest - in stores, at trade shows and in promotional materials. To enter the Win the Truck that’s Tough as Nails contest, members of Home Hardware’sTough As Nails Contractor Club were able to enter a ballot at one of the seven Tough as Nailscontractor shows that took place between January and April of this year. They were also able to enter by visiting http://www.buildmybusiness.ca/. The winner was selected by a random draw for the grand prize of the 2009 Toyota Tundra 4x4 Double Cab SR5 Long Bed 5.7L V8, the perfect choice for hard-working Canadians who need a capable truck for any job that offers power, fuel-efficiency, utility and comfort. Home Hardware Stores Limited is Canada's largest independent hardware, lumber and building materials and furniture retailer with more than 1,000 stores across Canada, under the Home Hardware, Home Building Centre, Home Hardware Building Centre and Home Furniture banners. Dealers have access to 100,000 quality brand name and private label products and the company has annual retail sales of $4.85 billion. The cooperative was founded on January 1, 1964 by 122 independent hardware Dealers. Toyota Canada Inc. (TCI) is the exclusive Canadian distributor of Toyota and Lexus cars, SUVs and trucks, and Toyota industrial equipment. TCI’s head office is in Scarborough, with regional offices in Vancouver, Calgary, Montreal and Halifax and parts distribution centres in Toronto and Vancouver. TCI supports more than 300 Toyota, Lexus and Toyota Industrial Equipment dealers in Canada with services that include training, marketing and environmental and customer satisfaction initiatives. Toyota’s Canadian operations include automotive assembly plants in Cambridge, ON (Toyota Corolla, Toyota Matrix, Lexus RX350) and Woodstock, ON (Toyota RAV4), which together employ more than 5,700 Canadians. Local Owen Sound resident Chris Taylor, was surprised to learn he was the grand prize winner of a 2009 Toyota Tundra while making a routine visit to his local Home Hardware Building Centre. Chris entered a ballot for the contest in January while in attendance at Home Hardware’s Tough as Nails Contractor Show in Orangeville with local business Steve Doherty Construction of Owen Sound.